If any given Borderlands game is about half as exciting as its trailer, we can expect pretty good things from its Pre-Sequel. This here’s a country-rock stomp through the motives of its cast of future villains and their mission: to save a moon. Nominally set on one of Pandora’s moons, Borderlands: The Pre-Sequel actually takes place in fan service central. Its plot, squeezed into chronology between the two existing games, makes an anti-hero of irreverent villain Handsome Jack – and a playable character and perennial series mascot Claptrap. Over on the PlayStation Blog, Gearbox’s Andrew Goldfarb has been talking up Claptrap’s combat abilities. VaultHunter.exe is an action skill that sees the android-on-castors endowed with one of several random abilities for a brief period. That might mean a chance to play Gunzerker or Mechromancer, or indiscriminate grenade-belching and violent malfunction. 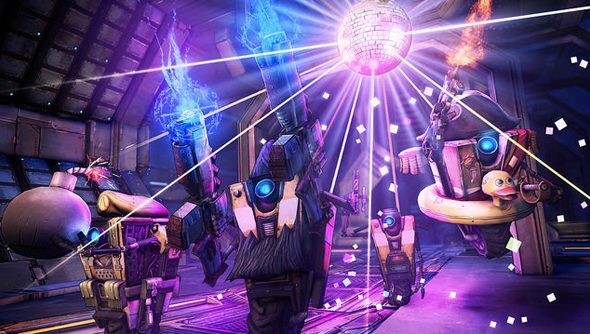 As he levels, Claptrap can cycle between subroutines to increase his efficiency in shooting, health regeneration and defence – and can gain a temporary buff with the World’s Saddest High Five skill – “depending on whether or not your teammates leave you hanging”. The Pre-Sequel is out on October 14 in North America, and will trundle over to the UK three days later. Ever wondered what it’d be like to have wheels?